After eating my chèvre chaud I enjoyed the rest of my lunchtime break sketching in a coffee place near my office. 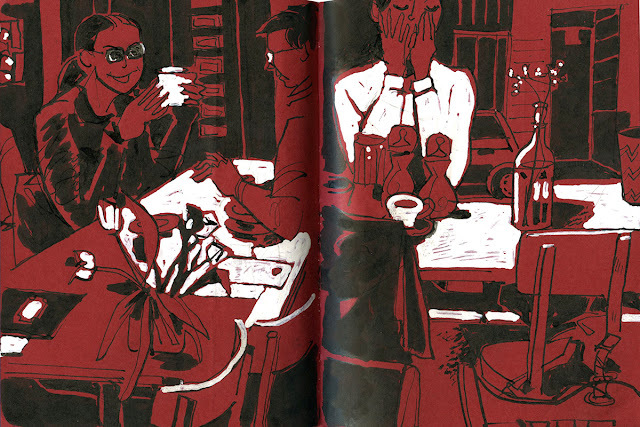 I still use a colorful sketchbook from Fabriano, red color pages inspired me to put some tipex-highlights after inking. I've always wanted to try this technique - and I know that coffee place! Great atmosphere in the sketch. cool! wie echt grelles kunstlicht. ich mag das plakative. Ich mag den grafischen Effekt sehr. Tolle Idee! Hoffe es folgen noch mehr in dieser Art. Its like trying out a new recipe, experimental and nice! Really nice, it fills up the page with an electric and lively atmosphere. It gives the impression, we are there with you. Diese neue Serie auf rot "kommt echt gut"